How teacher Ladopoulos Katrina use 72W High-Speed 6-Port USB SuperCharger in the classroom. 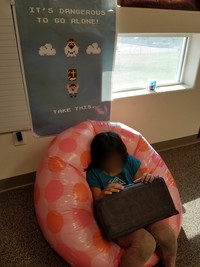 How teacher Grantham Karen use PadPillow Pillow Stand for iPad - Charcoal Gray in the classroom. How teacher Ferrin Jonah use PadPillow Pillow Stand for iPad - Charcoal Gray in the classroom.